Understanding the history of Earth is challenging. We can’t jump in a time machine and travel back 2.3 billion years to observe the Great Oxidation event. Or, even more tantalizingly, revisit over 4 billion years ago to see life begin to take hold. But clues exist all around us. The rocks beneath our feet, at the tops of mountains, and at the bottom of the ocean, can each tell a story about how and when they formed. To piece together these stories, Deep Carbon Observatory scientists are looking to the power of big data. Over the next three years and beyond, investigators at the University of Arizona and Carnegie Institution for Science in Washington, D.C. are deploying big data and multi-disciplinary expertise to document the diversity and distribution of more than 500 minerals of carbon found in Earth’s crust and upper mantle. This effort, known as the “Carbon Mineral Evolution” initiative, is probing carbon mineralogy over Earth’s 4.5 billion year history, unlocking the evolutionary secrets in its rocks and minerals. To understand Earth we must understand how it has evolved over time. To study its history, scientists look to reservoirs of historical information in earth materials. Three states of matter make up the planet—gases, liquids, and mostly crystalline solids called minerals. Gases and liquids are the major agents of planetary change, but they are short lived and do not serve as suitable stores of geologic information. In contrast, minerals are long-lived reservoirs of geohistorical information. They have been forming since the birth of our solar system, with some nearly as old as Earth itself. Their compositions, structures, and transformations record Earth’s entire history; thus developing new and more detailed ways for exploiting this record is one of the most fundamental and important endeavors in science. Carbon Mineral Evolution scientists are documenting the diversity and distribution of crystalline carbon-bearing minerals, and how they have changed over geologic time. The investigators are conducting their work in the context of two ways of thinking about minerals, which emerged over the course of the last eight years: mineral evolution and mineral ecology. The Deep Carbon Observatory scientists involved (Dr. Robert T. Downs and graduate student Joshua J. Golden of the University of Arizona, and Drs. Robert Hazen and Shaunna Morrison of the Carnegie Institution for Science) are using multiple resources and an integrated knowledge base to connect carbon mineral evolution with Earth’s co-evolving geosphere and biosphere. Over the last decade, the mineralogy group at the University of Arizona, in close collaboration with scientists at the Carnegie Institution for Science and researchers at several other institutions, have built large and expanding databases of mineral species and their properties (rruff.info/ima), as well as their localities and petrologic contexts (e.g., mindat.org). These resources record, in thrilling detail, the diversity and distribution of mineral species on Earth. The team is currently working on two interconnected activities. The first involves developing and exploiting these data resources, using statistical modeling and visualization tools to understand quantitatively Earth’s changing carbon mineralogy from crust to upper mantle through 4.5 billion years of Earth history. The second is expanding and exploring the Deep-Time Data Infrastructure (http://dtdi.carnegiescience.edu), which combines mineralogy, petrology, geochemistry, paleobiology, and proteomics resources, linking carbon mineral evolution to emerging principles regarding Earth’s co-evolving geosphere and biosphere. Through this work, the team will create new resources for exploring the nascent field of carbon mineral evolution, with its statistical cousin, mineral ecology. Just as life has diversified over time, so have Earth’s minerals. First came carbon in the form of nano-diamonds, accompanied by a dozen other “ur-minerals” initially formed more than 13 billion years ago in the hot, expanding gaseous envelopes of energetic stars. The first stages of Earth’s carbon mineral evolution 4.57 billion years ago are preserved in the rich record of meteorites, which reveal mineral-forming processes that occurred in the solar nebula prior to the formation of planets. More than 250 different minerals, a dozen of which incorporate carbon, reflect planetesimal differentiation, as well as alteration by aqueous, thermal, and shock processes (McCoy 2010). Subsequent stages of carbon mineral evolution saw diversification related to a complex combination of physical, chemical, and ultimately biological processes (Hazen et al. 2013b). The evolution of Earth’s near-surface carbon mineralogy, notably the diversity and distribution of carbonate minerals, is intertwined with episodes in the origin and evolution of life, including the emergence of chemolithoautotrophic microbial communities by ~3.5 Ga (correlated with the earliest evidence for marine carbonate precipitation); the rise of photosynthetic organisms, which culminated in the Great Oxidation Event at ~2.4 Ga; the innovation of skeletal bio mineralization at ~600 Ma, which irreversibly altered the carbon cycle and, consequently, the nature and distribution of carbonate minerals; and the expansion of the terrestrial biosphere and associated dramatic changes in the near-surface cycling of carbon following the innovation of rooted plants at ~400 Ma. Mineral evolution research has led to a new statistical approach called “mineral ecology.” This approach considers diversity and frequency distributions of mineral species on Earth--that is, how common minerals are and in what conditions they form. Mineral frequency distributions are analogous to occurrences of words in a book: a few words are common, but most are rare and used only once or twice in a given text. Similarly, of the more than 5100 species of minerals approved by the International Mineralogical Association, fewer than 100 common minerals account for more than 99% of Earth’s crustal volume, with a handful of feldspar mineral species comprising approximately 60 volume percent (Rudnick 2003; Levin 2009). By contrast, most mineral species are known from 5 or fewer localities and are thus rare (Hazen & Ausubel 2016). This pattern is called a Large Number of Rare Events (LNRE) distribution—a statistical model that facilitates the determination of “accumulation curves,” which are widely used in ecosystem research to estimate total biodiversity (Hystad et al. 2015a, 2015b; Hazen et al. 2015a, 2015b). Knowing this, we can predict the chemical and physical characteristics of minerals we haven’t found but should exist on Earth. Among these, almost 150 carbon-bearing minerals await discovery— a finding that inspired DCO’s international Carbon Mineral Challenge (mineralchallenge.net). Within the first six months of the challenge, mineralogists reported seven new carbon minerals, including one species of sodium-lead carbonate predicted by Hazen et al. Carbon Mineral Evolution promises to provide a fresh perspective of Earth’s history by addressing suites of new questions. The answers to these questions may profoundly influence Earth materials research and education by telling the story of Earth in a new and exciting way. Did carbon-bearing minerals play a role in life’s origins? What as yet undiscovered carbon minerals occur deep in Earth’s mantle and core? 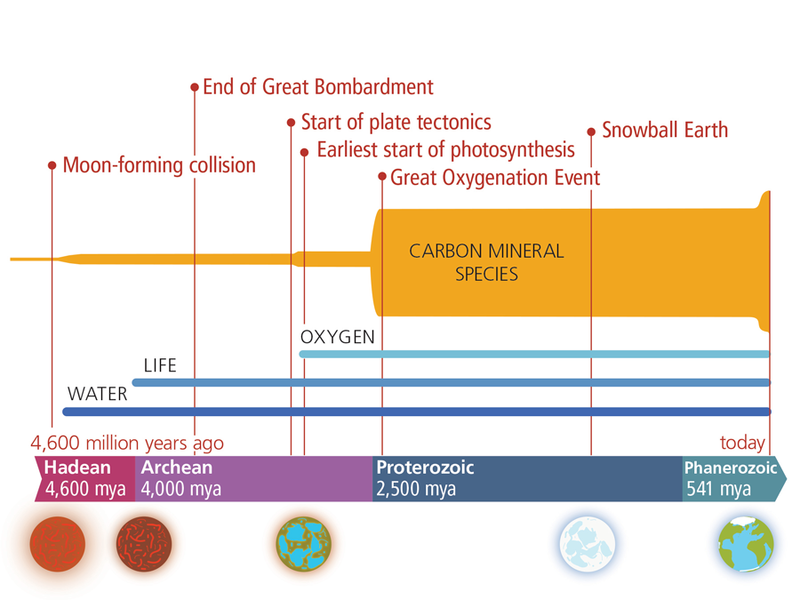 How did the evolution of life affect the evolution of carbon minerals (and vice versa). Why are so many carbon-bearing minerals extremely rare? Are there carbon-bearing minerals on the Moon and Mars and, if so, where are they? Dr. Robert T. Downs is a professor of Geosciences at the University of Arizona. He is chair of the Mineralogical Society of America Outreach Committee, a member of the Executive Board of the International Mineralogical Association, a co-investigator of NASA’ Curiosity Mars Science Laboratory, and director of the RRUFF project, (rruff.info). Dr. Shaunna Morrison is a postdoctoral research associate at the Carnegie Institution for Science under the mentorship of Robert Hazen. She is also a CheMin instrument lead on the NASA Mars Science Laboratory Mission (Curiosity rover). She is consolidating deep-time data on carbon minerals, commencing the study of carbon mineral distribution as a function of depth, and developing mineral network analysis techniques with application to comparative planetology and phase equilibria. Graduate student Joshua J. Golden played a leading role in the development of the mineral evolution feature of rruff.info/ima. He is a PhD candidate under the supervision of Robert Downs and is responsible for continued expansion of this database with carbon mineral data. Big data is revealing new minerals and new deposits. In a groundbreaking study led by Shaunna Morrison and DCO Executive Director Robert Hazen, scientists applied network theory (best known for analysis of the spread of diseases, terrorist networks, or Facebook connections) for the first time to mineralogy. The results are pioneering a potential way to reveal mineral diversity and distribution worldwide, how minerals evolve over deep time, and where new deposits of valuable minerals such as gold or copper may exist. Read more. BBC's Jonathan Amos interviews Bob Hazen about a mineral spike that marked the Anthropocene. Listen in. Human industry and ingenuity has done more to diversify and distribute minerals on Earth than any development since the rise of oxygen over 2.2 billion years ago, say a team led by Robert Hazen of the Carnegie Institution for Science in a paper published recently in American Mineralogist. The team identifies for the first time a group of 208 mineral species that originated either principally or exclusively due to human activities. That’s almost 4% of the roughly 5,200 minerals officially recognized by the International Mineralogical Association (IMA). Twenty-nine of the 208 human-mediated minerals contain carbon. The work bolsters the scientific argument to officially designate a new geological time interval distinguished by the pervasive impact of human activities: the Anthropocene Epoch. To learn more, click here. Robert M. Hazen and Robert Downs have been working on projects together for the more than a quarter century. They have perfected the art of launching and successfully executing big projects like Carbon Mineral Evolution. This project will formally launch in January 2017. These seasoned collaborators will lead research teams at their respective institutions as principal investigators of the Carbon Mineral Evolution project. Check back regularly for updates as the project progresses. Downs RT (2006) The RRUFF Project: an integrated study of the chemistry, crystallography, Raman and infrared spectroscopy of minerals. Program and Abstracts of the 19th General Meeting of the International Mineralogical Association in Kobe, Japan, O03-13. Hemley RJ (2014) Carbon in Earth: Quantities, Movements, Forms, and Origins. Midterm Report of the Deep Carbon Observatory (Deep Carbon Observatory, Washington, DC) 30 p.
Hazen RM (2014) Mineral fodder. Aeon Magazine, published online 6/24/14, 7 p.
Hazen RM, Hystad G, Golden JJ, Hummer DR, Liu C, Downs RT, Morrison SM, Grew ES (2016) Cobalt mineral ecology. American Mineralogist, in review.